Lynn and I were blown away yesterday as our church honored us for our 31st anniversary at Denbigh with a dinner after church (including two HUGE cakes) and a painting-style picture of our Denbigh church family (now hanging in my office). 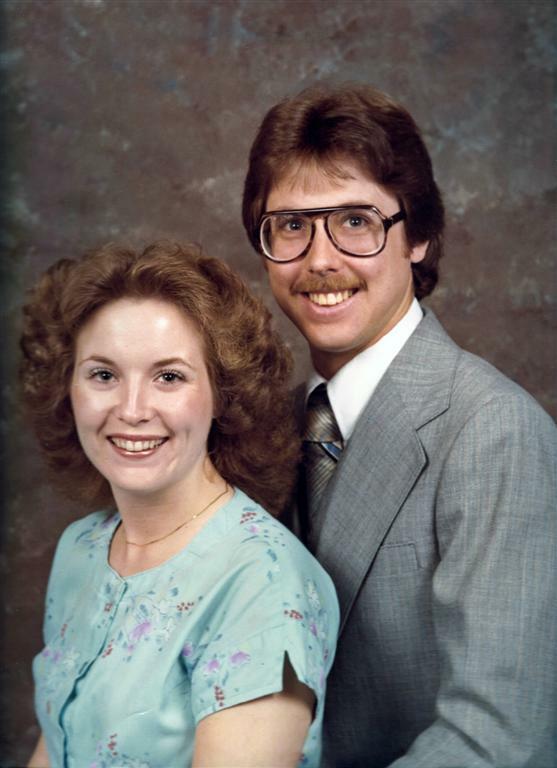 Lynn and I came to Denbigh as the associate/youth minister in May of 1980 (this picture was taken a few months after our arrival). Lloyd Unsell, the pulpit preacher, left about 2 months later to return to Oklahoma, and I received very quick and unwelcome promotion. (My Dad was one of the elders at the time, and some expressed concern that this was a conflict of interest; we decided that nepotism was OK… as long as you kept it in the family.) Technically, I served for several years as the "Interim Evangelist" while the elders looked for a new pulpit guy. But they hated going through a selection process and kept putting off actually looking for a new guy. After several years, they decided I was doing an OK job… and no one else was willing to work for $200 a week. After 31 years, Lynn and I are still here. There was once a church which had a reputation of firing their preacher every year. But then they hired a new guy and after his year was up, they extended his contract. They extended it again after his second year. And after the third year, they offered the guy a lifetime contract. Well, he was flattered and asked them why they once changed preachers every year and now had offered him a lifetime contract. One of the elders said, “Well, to tell you the truth, we don’t like preachers and we don’t really want a preacher; you are about as close to no preacher as we have been able to find!" So there may be several explanations for my ministerial longevity. Whatever the reasons, Lynn and I feel so blessed that we have been able to work with the Denbigh Church of Christ for all these years. From the very beginning, Denbigh has given me the greatest blessing a preacher can every hope to receive from a church—an openness to preach messages from scripture even when those messages don’t necessarily fit within our comfortable church tradition. The church has not always agreed with what I have preached, but they have always been willing to listen and to love me anyway. Sermons that at some places would have been “moving sermons” (sermons where the preacher has had to move afterwards) has been met at Denbigh with “you make me think today and I’ll have to do some more study on that.” There is no greater blessing a church can give a preacher than the willingness to listen and be driven back to the Book. Many preachers have to move all over the country in order to grow in their understandings and change their basic stances on basic issues; I have been blessed to stay at one place and grow and change and watch the church grow along with me. Jesus said that “a prophet has no honor in his own country” (John 4:44). But then sometimes a preacher can be honored in his own country... much more than he deserves to be. “May the grace of the Lord Jesus Christ, and the love of God, and the fellowship of the Holy Spirit be with you all” (2 Cor 13:14).